Please take the time to review our terms and conditions before you place an order for any Fast Tracks product or before you submit an idea for a new product or an improvement to one of our products! All Fast Tracks products are warranted to be free of defects in workmanship and materials and come with a 100% satisfaction guarantee or your money refunded. If you are not satisfied with any product, please contact Fast Tracks directly by email at service@fast-tracks.net to arrange for return and a full refund. Fast Tracks is owned & operated by Fast Tracks Hobbyworks Inc. Charges to your credit card for Fast Tracks products that you order from this website will show on your statement as Fast Tracks Some credit card companies do abbreviate our name in strange ways however. You can order our products by browsing our catalog and adding the products you wish to purchase to the shopping cart. Once you have added the products you want to order to your shopping cart, click on the Go To Checkout button. You will then be prompted to enter your shipping and payment information. Upon submission of your order you will be sent a confirmation email detailing the products that you ordered and all invoicing/shipping information. You can also review your order details by logging into your account on our website. If there are any errors or problems with your order, please contact us immediately at service@fast-tracks.net. Each item on our site will include the current quantity that we have in stock and a lead time projection for additional stock. Current stock quantity is continuously updated as other customers order inventory. We also update the current quantities several times each business day to reflect stock count corrections and the arrival of new inventory. The stock quantity is not guaranteed and is subject to change or correction. The lead time projection for additional stock is based on our previous experience with getting inventory from our suppliers, or our typical production lead times. The lead time projection is our best estimate, is not guaranteed, and is subject to change or correction. Shipping times provided on the Shipping Options page on our website are provided by Canada Post, are NOT guaranteed and can take longer on occasion. It has been our experience that while the shipping times provided by the post office are usually fairly accurate, there will be occasions were it will take longer. If you need your order be a specific date, we recommend that you use a UPS Expedited or Express option instead. If you pay for your order with Visa, MasterCard or AMEX we will not debit your credit card until we actually ship some or all of your order. If you pay for your order by Check or Bank Draft, your order will be held until we receive your check/bank draft. Check and Bank Drafts must be in US funds, drawn on a North American bank and negotiable internationally. We cannot accept Bank Drafts that are only negotiable in the US. We are unable to accept Purchase Orders or COD orders at this time. All pricing is based on US dollars and is subject to change without notice. All charges are invoiced in US dollars and will be converted to your local currency by your credit card company. For your convenience we provide a currency exchange function that allows you to view the prices of all our products in the currency of your choice. Exchange rates are updated each business day, are approximate and are subject to correction or change. Charges will be invoiced in US dollars and will be converted to your local currency by your credit card company. Pricing is only guaranteed to be accurate in US dollars. From time-to-time we may offer discounted and free shipping based on the value of your order and the shipping destination. Shipping discounts are automatically calculated based on the items in your cart. Discounted/Free Shipping offers may be discontinued at any time. Shipping costs are based on current rates as published by UPS or USPS. We do not add to or inflate the shipping costs provided to us by UPS or USPS. To determine the cost to ship your order, simply add items to the cart. We can ship to you via UPS. We can ship to you via UPS or Canada Post. GST is automatically added to all Canadian orders. HST is applied to all orders being shipped to an address in Ontario. We will accept International orders from most countries. We can ship to you via UPS. Duties and brokerage charges may be assessed by your counties customs service and the shipping company. From time-to-time we do accept a commission to produce customized assembly fixtures and accessories for scales and track types that are not part of our regular inventory. 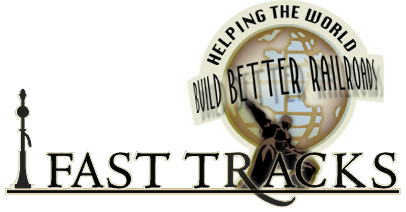 To learn more about custom tools, please contact us by email at service@fast-tracks.net. We will review your requirements and if we are able, will provide a quote. We reserve the right to add any custom designed product to our catalog using our regular pricing. Custom produced products are exempt from special offers or discounts. We make every effort to ship your order on time so that your order will arrive on the projected delivery date, however projected delivery times are not guaranteed. To expedite an order, please send an email message to service@fast-tracks.net. We will do our very best to respond to your expedite request within 2 business days. If you are not 100% satisfied with our products you may return them within 30 days of purchase for a full refund (less shipping charges) as part of our unconditional satisfaction guarantee. Items returned after 30 days may be subject to restocking fees. You are welcome to return items in exchange for items in a different scale or rail size providing the tools have been unused and are in resalable condition. A 20% exchange fee may be applied for scale or rail size exchanges. Sorry, we are unable to provide exchanges for tools or supplies that have been used. Custom built products are non-returnable. For more information about returns, please refer to our complete Returns Policy. You may cancel any unshipped, non-custom orders without penalty. If a non-custom item has already been shipped, you may return the item for a full refund less any shipping charges. You may only cancel custom ordered items if we have not started the construction. To cancel an order please send an email message to service@fast-tracks.net. We make every effort to ensure that the information provided on our websites is current and accurate. However, misprints, errors, inaccuracies, omissions (including incorrect specifications for products) or other errors may sometimes occur despite our best efforts. Fast Tracks does not warrant that the content of our Website including, without limitation, product descriptions, availability or photographs, is accurate or complete. limit quantities available for sale or sold. Before you send us a suggestion for improvement or an idea for a new product, please be sure to read the following statement very carefully! We very much appreciate any feedback or suggestions for improvements that you provide, however it is important to understand that unsolicited information that you freely provide may be used in our products without compensation to you. If you want to negotiate compensation for your suggestion or idea, you need to contact us before you submit your suggestion, otherwise your suggestion will be considered as freely given with no compensation of any sort expected. The act of providing any such suggestion, ideas, feedback, or materials constitutes an assignment to Fast Tracks of all worldwide right, title and interest, including copyright and other intellectual property rights, in and to the material and information you provide to Fast Tracks. Fast Tracks will be under no obligation whatsoever to use, respond to or pay any compensation with respect to any idea, submission or suggestion provided by you and may or may not use any such idea, suggestion or submission at any time in Fast Tracks's sole discretion. By providing any comment, suggestion, idea or other submission to Fast Tracks, you represent and warrant that you own or otherwise control all of the rights to such comments, suggestions, ideas or submissions including, without limitation, all the rights necessary for you to provide the such comments, suggestions, ideas or submissions to Fast Tracks and for Fast Tracks to use, copy, reproduce, modify, create derivative works from, transfer, distribute, perform, publish, license or sell the same. The entire content included in this site, including but not limited to text, graphics or code is copyrighted as a collective work under Canadian and other copyright laws, and is the property of Fast Tracks Hobbyworks Inc. The collective work includes works that are licensed to Fast Tracks Hobbyworks Inc. Copyright (c) 2016, Fast Tracks Hobbyworks Inc. ALL RIGHTS RESERVED. Permission is granted to electronically copy and print hard copy portions of this site for the sole purpose of placing an order with Fast Tracks Hobbyworks Inc. or purchasing Fast Tracks Hobbyworks Inc. products. You may display and, subject to any expressly stated restrictions or limitations relating to specific material, download or print portions of the material from the different areas of the site solely for your own non-commercial use, or to place an order with Fast Tracks Hobbyworks Inc. or to purchase Fast Tracks Hobbyworks Inc. products. Any other use, including but not limited to the reproduction, distribution, display or transmission of the content of this site is strictly prohibited, unless authorized by Fast Tracks Hobbyworks Inc. You further agree not to change or delete any proprietary notices from materials downloaded from the site. All trademarks, service marks and trade names of Fast Tracks Hobbyworks Inc. used in the site are trademarks or registered trademarks of Fast Tracks Hobbyworks Inc. Your use of this site shall be governed in all respects by the laws of the province of Ontario, Canada, without regard to choice of law provisions, and not by the 1980 U.N. Convention on contracts for the international sale of goods. You agree that jurisdiction over and venue in any legal proceeding directly or indirectly arising out of or relating to this site (including but not limited to the purchase of Fast Tracks Hobbyworks Inc. products) shall be in the provincial or federal courts located in Ontario, Canada. Any cause of action or claim you may have with respect to the site (including but not limited to the purchase of Fast Tracks Hobbyworks Inc. products) must be commenced within one (1) year after the claim or cause of action arises. Fast Tracks Hobbyworks Inc.'s failure to insist upon or enforce strict performance of any provision of these terms and conditions shall not be construed as a waiver of any provision or right. Neither the course of conduct between the parties nor traade practice shall act to modify any of these terms and conditions. Fast Tracks Hobbyworks Inc. may assign its rights and duties under this Agreement to any party at any time without notice to you. Harassment in any manner or form on the site, including via e-mail, chat, or by use of obscene or abusive language, is strictly forbidden. Impersonation of others, including a Fast Tracks Hobbyworks Inc. or other licensed employee, host, or representative, as well as other members or visitors on the site is prohibited. You may not upload to, distribute, or otherwise publish through the site any content which is libelous, defamatory, obscene, threatening, invasive of privacy or publicity rights, abusive, illegal, or otherwise objectionable which may constitute or encourage a criminal offense, violate the rights of any party or which may otherwise give rise to liability or violate any law. You may not upload commercial content on the site or use the site to solicit others to join or become members of any other commercial online service or other organization. Fast Tracks Hobbyworks Inc. does not and cannot review all communications and materials posted to or created by users accessing the site, and is not in any manner responsible for the content of these communications and materials. You acknowledge that by providing you with the ability to view and distribute user-generated content on the site, Fast Tracks Hobbyworks Inc. is merely acting as a passive conduit for such distribution and is not undertaking any obligation or liability relating to any contents or activities on the site. offensive or otherwise unacceptable to Fast Tracks Hobbyworks Inc. in its sole discretion. You agree to indemnify, defend, and hold harmless Fast Tracks Hobbyworks Inc., its officers, directors, employees, agents, licensors and suppliers (collectively the "Service Providers") from and against all losses, expenses, damages and costs, including reasonable attorneys' fees, resulting from any violation of these terms and conditions or any activity related to your account (including negligent or wrongful conduct) by you or any other person accessing the site using your Internet account. In an attempt to provide increased value to our visitors, Fast Tracks Hobbyworks Inc. may link to sites operated by third parties. However, even if the third party is affiliated with Fast Tracks Hobbyworks Inc., Fast Tracks Hobbyworks Inc. has no control over these linked sites, all of which have separate privacy and data collection practices, independent of Fast Tracks Hobbyworks Inc.. These linked sites are only for your convenience and therefore you access them at your own risk. Nonetheless, Fast Tracks Hobbyworks Inc. seeks to protect the integrity of its web site and the links placed upon it and therefore requests any feedback on not only its own site, but for sites it links to as well (including if a specific link does not work). We reserve the right to amend and update our Terms at any time without notice. This policy was last updated on February 22, 2018.